Rita J. Dinielli was born March 5, 1934, in Chicago to James and Kathleen (nee Joyce) Morley. 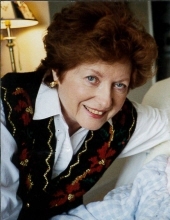 She died October 12, 2018, at Northwest Community Hospital in Arlington Heights surrounded by her family. She was a long-time member of St. James Church. She enjoyed playing golf and traveling. Rita is survived by her sisters Theresa (Bob) Kelley and Karen (John) McDonnell; many nieces and nephews and great nieces and nephews and by her cousins in County Mayo, Ireland. Rita is preceded in death by her husband Nicholas Dinielli; her brother James (Helbe) Morley and by her parents. Visitation Wednesday, October 17, 2018 from 4 PM until 8 PM at the Glueckert Funeral Home, Ltd., 1520 N. Arlington Heights Road, (4 blocks south of Palatine Road) Arlington Heights and Thursday, October 18, 2018 at Holy Family Catholic Church, 2515 W. Palatine Road, Inverness from 9:30 AM until the time of mass at 10:30 AM. Interment St. Michael the Archangel Cemetery. In lieu of flowers, memorial contributions may be given to Friedreich’s Ataxia Research Alliance, 533 W. Uwchlan Ave., Downingtown, PA 19335., in honor of Rita Dinielli in support of Laura Riermaier. Please note: in honor of Rita Dinielli in support of Laura Riermaier. "Email Address" would like to share the life celebration of Rita J. Dinielli. Click on the "link" to go to share a favorite memory or leave a condolence message for the family.